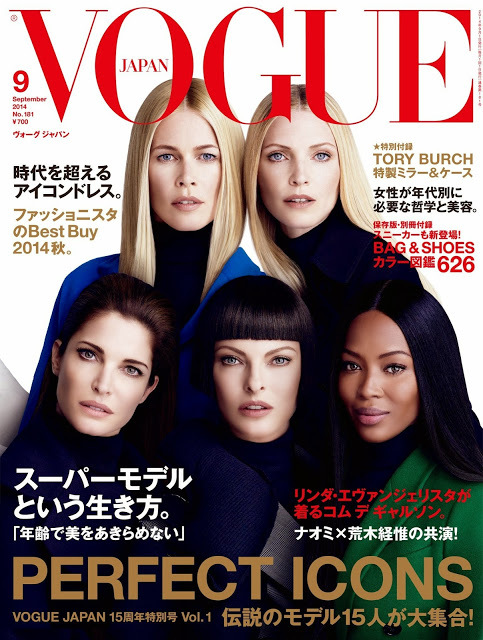 Vogue Japan is celebrating its 15th anniversary with an iconic cover for its September 2014 issue. A folding cover that features 15 of the most iconic models. On its main page the five of the most famous models of the 90’s which were the first ones to be called ‘supermodels’ : Stephanie Seymour, Linda Evangelista, Naomi Campbell, Claudia Schiffer Nadja Auermann. A great way to celebrate 15 years of beautiful covers and amazing photo shoots with an issue that gathers in its pages some of the models that have their names part of the history of fashion. The cover of the Vogue Japan September 2014 was shot by duo Luigi+Iango. Definitely an issue that we have to put our hands on.